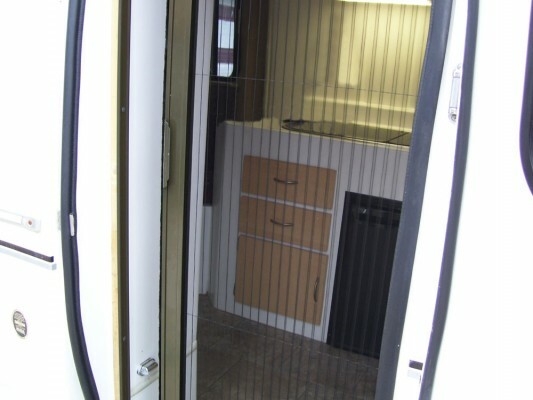 Retractable screen door shown half open on a RoadTrek conversion van. 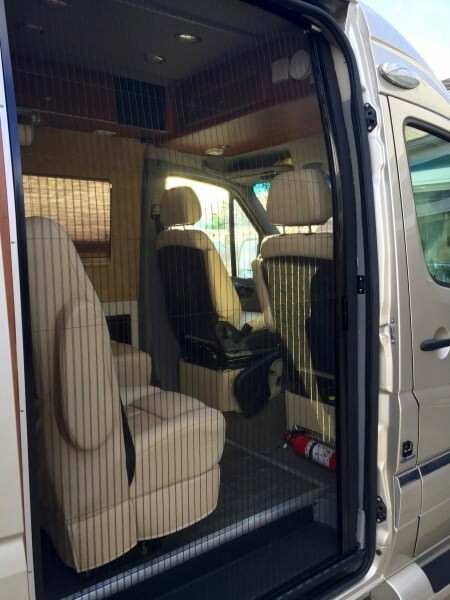 We recently had the opportunity to custom build a Plisse retractable door screen for a 2014 RoadTrek RS Adventurous sprinter conversion van. Though we’ve been building screens for RV’s and motorhomes for years now, this was or first conversion van and we couldn’t be more pleased with the outcome. 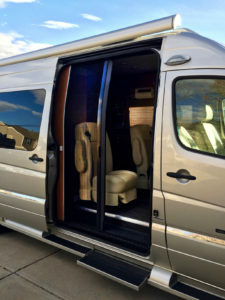 “It’s like it was built as part of the van conversion,” said owner Dan Gibson of Colorado. He was so pleased he took the pictures in the gallery below. The best part is, there was no significant modification to the van needed. But as you can see, it fits right in and practically disappears when retracted. 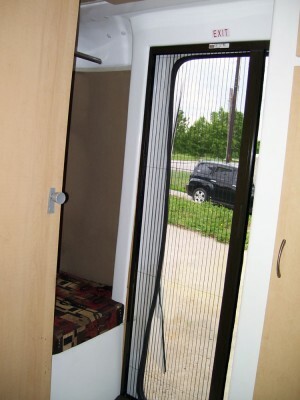 We have been building custom screens for RV’s for several years. 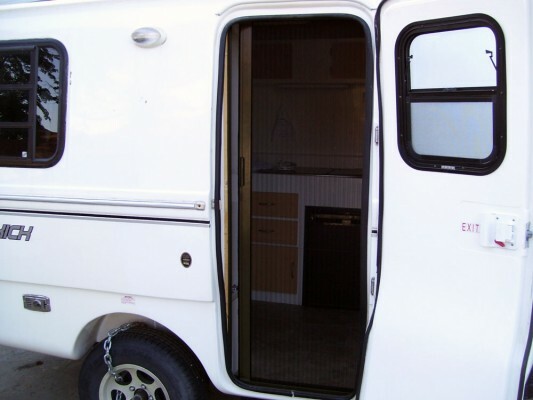 We have made them for everything from Casita and Scamp fiberglass small trailers to Class A motor homes. 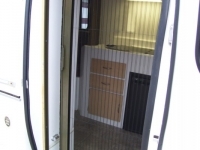 Over the years we have had many owners of Sprinter Van conversions inquire about a screen for the large sliding side door on their RV’s. There are many challenges to making a screen to fit this opening. The body of the van curves from top to bottom and at the top from front to back. The front side of the opening is formed by the irregular trim surfaces of the “B” post behind the passenger seat. For the last year we have been working on designs for both a functional and aesthetically pleasing solution to the problem of screening these openings. After considering many possible solutions we designed a modification to our Plissé retractable screen that satisfies these requirements. It was necessary to develop new processes and materials to solve the unique problems associated with this application. 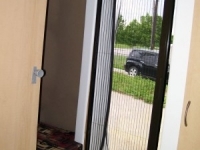 The solution we developed has a curve in the screen frame front to back that follows the curve of the van body. The top rail also curves inward because the top of the van is narrower toward the front. The screen is a three sided system with an extension to the housing or moving part that matches the shape of the back of the “B” post behind the passenger seat. The curve of the top rail makes the unit lean inward at the front allowing it seal against the trim at the front of the opening between the step extension switch and the grip handle. There was no significant modification to the van needed. Custom brackets were installed to attach the top rail and the area inside of the bottom rail was filled to bring it up to the height of the rail. A minor modification to the valve access door at the rear of the step was needed. 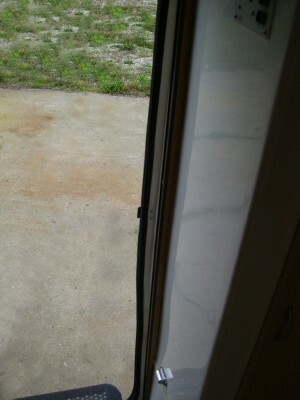 The curtain track was repositioned to attach to the top rail of the screen moving it inward about an inch and the curtain snaps were relocated at both the front and back of the opening. 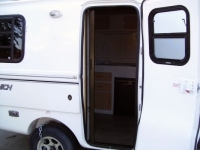 Developing the solution would not have been possible without having access to one of these vans during the design and fabrication. We would like to thank Dan Gibson from the Denver Colorado area for allowing us to use his 2014 RoadTrek RS Adventurous for this purpose and for his feedback as a user of the solution we developed. With the first unit installed and working we continue to improve the individual parts of the new system while we work on customizing it for other versions of the same van. 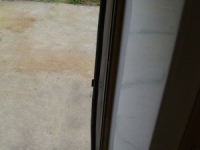 Customers with any of the many makes and models of Sprinter van conversions should contact us about a solution to screening this opening on their RV.